Can surprise only occur on the first turn of combat? Surprise can occur at any time, even in the middle of a Combat Turn. For example, a character may crash through a glass sunroof and land next to characters already engaged in a fight. Whenever such a situation occurs, have all characters involved make immediate Reaction Tests. Characters who score less successes than their opponents are considered surprised against those opponents until the end of their next Combat Phase. Are there any additional modifiers to the Dodge Test other than those listed on p. 113, SR3? Can you dodge grenades? Gamemasters are encouraged to apply other modifiers as appropriate to the situation and terrain. For example, a character surrounded by obstacles (chairs, desks, bushes) or in a restricted area (an elevator) could suffer a +1 or +2 modifier. A prone character could suffer a similar modifier. Grenades and other area-effect weapons may also be dodged, though the character should suffer at least a +2 modifier to his Dodge Test. The rules state that image magnifying scopes are not compatible with smartlinks, but what about cybernetic vision magnification or the equivalent adept improved sense? While a character may be simultaneously equipped with a smartlink system and an imaging scope/vision mag cyberware/vision mag adept power, the modifiers from both may not be used at the same time. So a samurai could use vision magnification to reduce the target number when shooting a target at long range, and then switch to using a smartlink to reduce the target number against a target at short range–but he couldn’t use both the smartlink and vision mag modifiers on the same target. Do called shots in ranged combat bypass armor, like they can in melee combat? 1. The Damage Code is increased by one Level (as stated on p. 114, SR3). The target’s regular armor applies. 2. The attack bypasses the target’s armor. In this case, the attack’s Damage Code is not modified, but the Power is not reduced by armor bonuses. (Note that the attacker can simply choose a location on the target that is less armored, rather than bypassing the armor completely, so that only the armor in that location applies). 3. Target a smaller part of a larger target (such as the tires on a vehicle). Can a character change the type of movement within his or her own Combat Phases? Technically, no. On her first Combat Phase of the Combat Turn, a character should declare whether she is walking, running or staying stationary. Declaring the mode of movement is important as it determines what target numbers apply for ranged combat for the remainder of that turn. This is true even if the character doesn’t take her full movement allowance during a Combat Phase. A razorgirl who declares she is running on her first Combat Phase still suffers running modifiers even if she doesn’t move on subsequent Combat Phases in that turn. Once walking or running has been declared, the character cannot change her movement mode until the first Combat Phase of her next Combat Turn. Characters who remain stationary may later declare to walk or run on a subsequent Combat Phase, in which case target number modifiers immediately apply. Gamemasters may, of course, choose to bend the rules and allow characters to switch movement modes each Combat Phase, but be warned that this creates additional complexities with target numbers and the exact distance that can be moved each phase. If you allow this, you end up with situations where a character who sprinted for two Combat Phases in a row (and was thus hard to hit) suddenly stops stationary and shoots back without suffering movement modifiers. Do the rules for two-weapon combat apply if I’m wearing a pair of shock gloves? Does the reduced Essence Cost from cyberware grade (alpha, beta or delta) count when calculating the “free” Essence Cost of accessories for cybereyes and cyberears? For example, does an opticam (normally 0.5 Essence, 0.4 alphaware) take up the full 0.5 of free Essence in the cybereye, or only 0.4? Yes, the grade counts when calculating the 0.5 of free Essence. So an alphaware opticam would only take 0.4 of the free Essence. Can a character have both a synaptic accelerator and boosted reflexes and gain the bonuses from both? What about a synaptic accelerator and reaction enhancers? Do symbiotes reduce healing time for both Physical and Stun damage? Can a character purchase bioware at character creation? What about cultured bioware? Nanoware? Generally, this is the gamemaster’s call, based upon how available s/he wants to make such gear in his or her game. We recommend to sticking to the Availability rule (no character can start the game with any gear with an Availability higher than 8). If you want an official call, then the answer is that all basic bioware with an Availability of 8 or less is available at character creation. Cultured bioware and nanoware are not, since they require the equivalent of a beta-clinic to implant. It says that attribute modifications from bioware are considered “natural” and not “augmented,” meaning that they affect the attribute’s base rating. Does this also mean that an attribute modified by bioware (not counting cyberware) cannot exceed the Attribute Maximum? What happens if my human character with natural Strength 6 (and Strength Attribute Maximum 9) gets muscle augmentation 4? Strictly speaking, bioware cannot raise an attribute’s natural rating above the Attribute Maximum. So the human character described above simply doesn’t need muscle augmentation 4 (and the street doc would probably tell him that … or maybe not, and just give him muscle augmentation 3 and keep the change). If the character had muscle augmentation 4 installed anyway, his Strength would still be limited to 9. If you desire a more high-powered game, then you can ignore this rule and allow bioware to exceed Attribute Maximums. The character’s natural attribute ratings should never be allowed to exceed the Attribute Maximums, however, and you may wish to inflict bioware-stuffed characters with system overstress or other excessive bioware drawbacks (p. 78, M&M). What’s the TN to detect cyberware equipment that is beta or delta grade (TN is 3 for normal and 6 for alpha)? Add +2 per extra grade (8 for beta, 10 for delta). Does the Invisibility spell work against thermographic vision? How does an Improved Invisibility spell function against a drone’s sensors? Is it resisted by the drone or can the drone just not see the character? What if the drone’s sensors include thermographic imaging? Technically, Improved Invisibility requires a Resistance Test, and non-living things don’t get to make Spell Resistance Tests. So the simple answer is that the spell automatically fools drones. If you allow a Sensor Test based on those components, you should apply some hefty modifiers, or perhaps only roll half the Sensor dice. Keep in mind that even if the drone detects the invisible character, it still won’t be able to “see” him, so it may get confused or otherwise not act the same as if it had actually detected something walking by. Do you see yourself when you’ve cast Invisibility on yourself? What about others you cast it upon? Invisibility affects everyone–caster, subjects and bystanders–alike. In order to see someone who is invisible, the viewer must successfully resist the spell. This applies to the caster and anyone made invisible by the spell. If you cast Invisibility on a wall, can you then cast spells at targets on the other side since line of sight is no longer obstructed, while still receiving cover from the wall from bullets? Yes. If you successfully cast Invisibility on a wall (keep in mind that the Force of the spell must be equal to or greater than half the wall’s Object Resistance), then it no longer blocks LOS and you can cast spells through it (except for elemental manipulations, which will still hit the wall). Likewise, the invisible wall will not provide cover from any ranged attacks (unless the attacker resists the spell’s effect), though it will provide an armor bonus, since the bullets must still pass through the wall. Can I cast Invisibility on a sword to hide it from people, or does it have to be Improved Invisibility, since the sword isn’t living? Does the Improved Invisibility spell I cast on the sword have to have a Force >= half the Object Resistance value of the sword in order to have any affect? Does the Improved Invisibility spell I cast on the sword have to have a Force >= half the Object Resistance value of the security cameras in order to hide it from the cameras? You can cast either Invisibility or Improved Invisibility on a sword to hide it; Invisibility will only hide it from living beings, however, whereas Improved Invisibility will hide it from cameras as well. The spell must have a Force equal or greater than half the Object Resistance of the sword (a modern sword, made out of modern composite alloys, would have an OR of 8, requiring a Force 4+ spell). The OR of the cameras does not matter, as they are not the _subject_ of the Invisibility spell. If I succeed in fooling a security camera with an Improved Invisibility spell, do people viewing the security camera output get a chance to resist the spell as well? What if they view the recorded image the next day? Does it matter if the sustained spell is still being sustained when they view the recorded image? No, if the spell is successful, then technological sensors fail to record the invisible person/object. What happens if a spell with a Drain Code of Damage Level +1 is cast at Deadly? This is true of spell drain calculated when the spell is cast as well. So Casting a spell with (Damage Level)+1 Drain at Deadly damage results in a Drain of (F/2)+2D. What happens if a spell with a Drain Code of Damage Level -1 is cast at Light? All spells have a minimum Drain of Light, so the caster will still face Light Drain. Can multiple Armor spells be cast on the same target? If so, are they full strength or do they follow the normal armor layering rules? Does the Armor spell count as layered armor if the target is wearing physical armor? Armor spells can be stacked on a target but only the strongest Armor spell would apply (the effects are not cumulative). Since an Armor spell is a magical effect, the character is not physically hindered by the Armor spell in any way. When casting a Control Manipulation spell, do you need to speak to the target or are commands issued through telepathic link? Can you issue commands to targets that don’t speak the same language as you do? Can you use control thoughts on animals? Do you need line of sight to issue commands? Commands are issued “telepathically” and so no verbalizations are required. Since the commands are raw mental input, language is not a barrier. Control Thoughts does work on animals because it allows the user to take over the animal’s mind; the animal’s lack of sentience wouldn’t be a problem because the animal’s intelligence isn’t really being used. Line of sight is not necessary to issue commands once the spell is cast, but keep in mind that if the target is out of sight, the caster might not have any idea of the target’s surroundings and circumstances (the telepathic communication is one-way) and so may not be able to issue commands accordingly. Can Increased Attribute spells raise an attribute over the Racial Maximum? Yes. It’s a magic boost and is not subject to physical limitations. Can you cast Decrease Attribute, followed by Increase Attribute (which is easier because the attribute TN is smaller), then un-sustain the Decrease Attribute, allowing you to have a higher Attribute than you’d have without having Decreased it? How about changing your Reaction after an Increased Reflexes spell? No. Only one attribute-affecting health spell can be used to modify an attribute at a time. How much weight can a Barrier spell hold if it is used to make a ramp? Not much. Barriers are meant to be obstacles, not load-bearing supports. As a general rules, a Barrier can support the weight of a metahuman or animal, but not a car or large vehicle. If you need specifics, go with Force x 25kg. For the Shapechange/Transform spells, can you choose to have a higher (or lower) Body rating for the creature you wish to shapechange into? No, the transformation turns you into the standard creature of that type (with the standard Body of the critter). You do not turn into a larger/smaller version of that animal. How does the Astral Armor spell work? Does it help against spells? Does it reduce the Power of Combat spells? What about the Astral Armor critter power? It acts as armor in astral space, reducing the Power of attacks made in astral combat. It has no effect on spells. The critter power of Astral Armor works the same way. Does the target of a Detection spell such as Detect Enemies or Mind Probe know that he is being targeted (outside of the standard rules for noticing spellcasting)? Does a person who resists the Detect Enemies spell when he enters its radius notice the fact that he is resisting it? What about a magician character who has allocated Spell Defense; can he defend against the spell, and doe she know he’s defending against the spell? Is it impossible to use Mind Probe on somebody without them knowing a spell is being cast on them? Generally, the rule is that no, people don’t automatically know they are being targeted, unless they notice the spellcasting in some other way (ie., they see the caster in action, or they spot the spell’s aura). This is a pretty fuzzy area, though, for several reasons. First, spells like Mind Probe are fairly powerful, so it may be too much to let players cast them without the target being aware. You could certainly say that someone would notice that his thoughts and memories are being rifled through … or maybe give the person a Perception Test of some sort (maybe the same test to notice when someone astral passes through their aura). Second, if the subject is assensing, they should be able to notice the aura of the spell in astral space. Again, however, it may be best to make this a Perception Test rather than a freebie. Where it really gets tricky is when the subject is a magician … technically, a magician should be able to allocate Sorcery dice and Spell Pool towards spell defense to defend against spells like this (or even against, say, Improved Invisibility). But if the character/player is made aware that they’re resisting, that may defeat the purpose of the spell. There’s a few ways gamemasters can handle this. The GM can simply rule that you can’t use spell defense against Detection spells like this unless it’s specifically been allocated in advance. If it has been allocated, then the spell defense and Resistance Test can be done without the player/character knowing, or the PC could be given a Perception Test as noted above. GMs should similarly decide whether Shielding (p. 79, MITS) raises the target number for Detection spells. Primarily, this is a choice based on how the GM wants to portray these spells in his games. Is it possible to identify what a spell is–not just its category–through assensing? If so, how many successes are required? Wouldn’t you need to know the spell yourself in order to be able to identify it this way? Assensing by itself will not tell you exactly what spell has been cast. Keep in mind that magicians cast spells according to their outlook, so a spell cast by one magician may look different than the same spell cast by another. Assensing can only determine the category and Force. If a magician holds up his hand, or a piece of paper, or whatever, to block a target from his vision, does that mean they’re not a “valid target” for an area effect spell? In SR3, do magicians who try to intentionally limit their area effect spells suffer some penalties or chance of spell misfire? In FanPro’s opinion, no GM should allow players to get away with this kind of stunt without penalty. A magician who plays these sorts of mind games with himself is asking for it–any attempt to thwart the intent of a spell simply causes it to fail outright, but the caster gets slammed with the Drain anyway. If the GM wants to allow players to get away with tricks like this, then apply the cover modifier that the caster wishes to give the excluded target to the TN of the spell. If the caster wants to give the excluded target total cover (anything less and the spell affects them–except in the case of elemental manipulations), then the spell’s TN increases by 8 (equivalent to blind fire, a +8 modifier). The magician could, of course, center against this penalty. If the caster wants to pull this stunt with multiple targets, the penalties stack unless the targets are very close together, in the GM’s opinion. (Just imagine trying to block two specific people entirely out of your field of vision in a crowd.) If you want to be really cruel, apply the TN modifiers to the spell’s Drain Test, too. Can I hit two gangers who are 9 meters apart by centering a 6 meter radius manaball between them? Or does the center of the manaball have to be one of the targets? You can center area effect combat spells wherever you like, as long as you can see the spot. So, yes, you can center an area effect spell directly between two targets so that you hit both. Spell Defense takes away successes from the spellcaster. For an area affect spell, are those successes taken away from everyone who is hit by the spell, even if only one person in that area is protected by spell defense? Yes. The spell defense works against the entire spell. Does Reach count in astral combat? Would an astrally perceiving (dual-natured) troll have his or her natural +1 Reach? Is glass/clear plastic see-through when astrally perceiving? The basic rule of thumb is this: if you can see through it in the physical world, then you can see through it on the astral plane. If you can’t see through it physically, then you can’t see through it astrally, either. The only real exceptions are astral barriers (and other astral things), which are at least partially opaque on the astral, but physically invisible. Does Invisibility work on the astral plane? If an initiated magician with Masking casts Invisibility on himself, and masks both his aura and the spell, is he invisible on the astral? Assensing is a psychic sense. It is not vision even though we often describe it using the same words we use to describe vision, and even though Awakened people often refer to astral perception as “the Sight.” So Invisibility spells have no effect on astral perception. In fact, the opposite is the case, as the aura of the spell itself is also visible to astral sight, unless it is masked. Can the spirit/critter power of Concealment make someone invisible on the astral? No. Concealment is a Physical power and so only works on the physical plane. The aura of the power is also visible to astral sight. There is no way to achieve “invisibility” in astral space. Can a non-materialized spirit or an astrally-projecting magician pick up a dual-natured item in astral space, such as an active focus, and move it around? Does the physical part of the dual object move too? Yes, if an item exists in astral space, it can be moved and used in astral space. This will move the item in physical space as well, though if the object is stopped by a physical wall or other impediment, it is stopped in astral space as well. Note that foci must remain in contact with their owner to remain activated and dual natured. If the owner of a focus is knocked out or falls asleep, the focus will remain on, but if they die it deactivates. What shape do wards take? Do astral barriers conform exactly to the shape of their physical components? Can the physical component a ward or astral barrier have gaps, like a window or a door? Can you place a ward on a net? When created or activated, an astral barrier usually conforms to the shape of its physical components. Astral barriers usually enclose a volume area; there’s little point in putting a barrier on a flat surface, since the barrier can be bypassed by going around it. In some cases, in order to enclose this volume, the barrier will not conform to any physical part; this is the case with hermetic circles, for example, which create a dome-shaped barrier even though there is no physical dome. You could, for example, ward the space between two buildings, forming a cubic barrier, even though you only have two walls and the ground as physical components; the ward would still stretch across the empty areas. Openings like doors and windows can also be covered by the barrier; these openings do not create an opening into the warded area, even if the door or window is opened at a later time. Essentially, the creator of the barrier decides what shape the barrier conforms to and what areas of space it traverses. The boundaries of the barrier must be clearly defined. Once the barrier is activated, its shape cannot be changed. It also cannot be moved from its physical component to another location. The barrier is immobile, so it cannot be activated on something that is worn or carried, like nets, shields or armor, as it will deactivate as soon as it is moved. It is, however, possible to ward areas inside of ships, trains, cars and trucks. Can the adept power of Improved Ability (p. 169, SR3) be applied towards other skills, such as Computer, Sorcery, Conjuring or Vehicle skills? No. This power only improves physical ability, not technical or magical abilities. As an optional rule, a gamemaster may allow Improved Ability to be applied towards Vehicle skills (at a cost of 0.5/level), but this would not improve a character’s Vehicle skills when rigged. If an adept wishes to improve an adept power with different levels (such as Increased Reflexes, Improved Ability, Mystic Armor and Combat Sense), does he need to buy the new power all over again from scratch, or just pay the difference between the two levels? The adept is, in effect, increasing his or her natural abilities, so only needs to pay the difference. For example, improving from Killing Hands S (power point cost of 2) to Killing Hands D (power point cost of 4) would cost 2 more power points, not 4. Can an adept tone down his Killing Hands power? Can an adept with Killing Hands S choose to strike with a base Physical Damage of Light? Can he choose to just inflict regular unarmed combat Stun damage, rather than Physical? Yes, an adept can “tone down” his Killing Hands, but this should be treated in a way similar to pulling punches. The player must declare what base Damage Level the adept is striking at before rolling dice. For each level the Damage Level is reduced, apply a +1 target number modifier to the test. An adept with Killing Hands can always choose to not use his Killing hands ability and to inflict regular Stun damage instead. 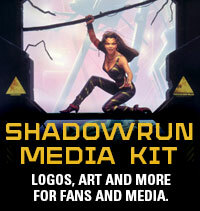 SR3 allows adepts to purchase additional power points at a cost of 20 Good Karma points each. Does this mean that an adept can have more power points than his Magic attribute? Or does the purchased power point increase the adept’s Magic? Can purchased power points be lost due to Magic loss? What happens if the adept’s Magic is reduced to 0, but he still has powers left? Adepts who purchase power points with Karma do not get an extra Magic point with that power point. You only get that with initiation. The power point for Karma rule was specifically included for players who do not use the advanced magic (initiation) rules. It is recommended that this rule be ignored if the initation rules in Magic in the Shadows are also being used. Any extra power points purchased with Karma do not count against the character’s limit of (Magic attribute) number of power points. When an adept loses Magic, he chooses which powers are lost; powers bought with Karma can be chosen instead of others. If an adept’s Magic reaches 0, the adept loses all magical ability, period. When a Magician’s Way adept initiates, it says that the adept must choose between obtaining a power point or learning a metamagic technique. But other adepts get both a power point and a metamagic technique when they initiate. Is this correct? Why the difference? Magician’s Way adepts initiate differently because unlike regular adepts and magicians, they receive the advantages of both worlds. The modified initiation rules prevent them from becoming unbalanced and overpowered. Does the adept power of Improved Sense (specifically, thermographic or low light vision) count as natural or augmented when determing visibility modifiers? If an adept with the Improved Sense power chooses a sense that normally has levels (select sound filter, vision magnification), so they have to spend .25 power points per level? No. The adept simply pays .25 power points and receives the sense at the highest level (select sound filter 5, vision magnification 3). Does a conjuring aspected magician have a Spell Pool for purposes of spell defense? Can he use power foci in the same way (for spell defense)? No, only spellcasters get Spell Pool, and you have to be skilled in Sorcery to use spell defense. So the answer to all of the above is no. Can adepts create foci? Would they use a hermetic library or a shamanic lodge? What about aspected magicians? There are many views on this subject and the printed rules are unclear. According to p. 168, SR3, “adepts do not use magical skills to perform magic.” According to p. 40, MITS, “only the Awakened can learn Enchanting skill.” Ultimately, this is the gamemaster’s decision on whether or not s/he wants to allow it in his or her games. In the opinion of the developer, yes, adepts can learn and use Enchanting skill (as can aspected magicians). It is recommended, however, that adepts and aspected magicians be limited to enchanting only foci that they can use. An adept, for example, could create and enchant weapon foci, but not spell foci. Likewise, a conjurer adept could create and enchant spirit foci, but not spell foci. And so on. Most adepts would use a hermetic library, though the character’s personal outlook may affect this. An adept following the Totem Way would likely use a shamanic lodge. Is there an equivalent to elemental mages (p. 17, MITS) for wujen? So a wujen aligned with Fire (for example) gets a bonus with combat spells and fire spirits but suffers a penalty for manipulation spells and ancestor spirits or spirits of man (associated with Metal). When checking for magic loss (p. 160, SR3) or focus addiction (p. 45, MITS), do you count Magic rating points that are kept by geasa? When a spirit or critter with Immunity (Normal Weapons) is attacked, do you only compare double its Essence to the base Power of the weapon (regardless of modifiers, as with the Hardened Armor power), or do you also count modifiers to the Power from burst fire, ammo type, extra successes, etc? Treat the Immunity power as you would the Hardened Armor power–only use the base Power of the weapon, unmodified by burst fire, ammo type, etc. In SR2, tissue samples were only viable as material links for [Essence] hours; is this also true in SR3? There is no such rule in SR3–we leave it up to the GM to decide, as appropriate for storytelling purposes. There are many factors that may affect the exact time–the amount of tissue/fluid, environmental conditions, etc. In any case, tissue samples shouldn’t be useful for long–no more than 24 hours and probably less, unless you use a Preserve spell. Can an initiated magician see through the masking of another initiated magician if she is not directly here, but sees it through her sense link with her ally spirit? Yes, the initiate can pierce the masking through the sense link (but the ally itself could not). Can I use a sustaining focus to sustain a spell such as Improved Invisibility on someone other than the caster, or on an object like a sword? Does the sustaining focus need to stay in contact with the subject of the spell? Yes, you can use a sustaining focus to sustain spells cast on other people, items or places. The sustaining focus sustains the spell on behalf of the caster, but must remain in contact with the subject of the spell. So if cast on an item like a sword, the focus would need to stay in contact with the sword. Why don’t the costs for guns match the price you get when you construct the weapon using the firearm design rules? None of the firearms described in Shadowrun sourcebooks were created using the firearm design rules in Cannon Companion. The firearm design rules were written after most of those guns were already in print. As a result, many of the statistics will not match perfectly. We attempted to structure the firearm design rules so that they would approximate the statistics of existing Shadowrun weapons, but it was simply impossible to match them all perfectly. Note also that the costs of a weapon designed using the rules in Cannon Companion will as a rule be higher than a similar off-the-shelf gun. This reflects the fact that you are custom-designing a weapon. Weapons that are mass-produced by megacorps have a lower cost simply because the costs of production are distributed over massive amounts of weaponry. Recoil Compensation. Numbers that appear in parentheses include recoil compensators that must be specifically used for the recoil comp to apply (for example, a folding stock). What’s the maximum rating you can raise Hardening to? Hardening cannot be of a rating higher than the deck’s MPCP rating. Do frames or agents continue running if the cyberdeck (not the decker) is offline? Can otaku have and command frames and agents? Sure, but they probably prefer sprites and daemons. There are target numbers given for noticing internal mounts and for noticing concealed armor, but nothing given for noticing pop-up turrets. Pop-up turrets have the same target number for being noticed as internal fixed mounts (Target Number 4). Like internal fixed mounts, succeeding at the test means the character has spotted the mount, but may not necessarily deduce what purpose it serves. Do rocket/missile launchers (which use “normal rockets/missiles” from Cannon Companion and SR3) installed on a vehicle require a medium launch control system? I am fuzzy on whether the launch system requirements for the large vehicle and anti-ship missiles apply to the usual man-portable missile launcher models (after they have been installed in a turret). Only antiship missiles require heavy launch control systems and missile mounts. All other missiles and rockets (including man-portable variants) only require medium launch control systems and missile mounts. Man-portable rockets and missiles listed in SR3 and Cannon Companion do not require the purchase of a launcher, with one exception: the man-portable Ballista Missile System must be purchased one per launch control system dedicated to firing Ballista missiles due to the special nature of that weapon system. The descriptions of the aircraft carrier and corvette show internal missile mounts contained within their respective turrets. Is this a typo? Are the missiles supposed to be installed in the turrets (if so, explain how they can fit all the missiles in there) or are they intended to be installed in silos within the warships’ decks? How many missiles may be mounted on a single missile mount? An external missile mount may mount any number of missiles, so long as the total weight of all those missiles does not exceed the mount’s weight limit (300 kg for standard mounts, 1,500 kg for internal mounts). For example, a Saab-Saaker AAM (p. 92) weighs 90 kg. Therefore a standard external missile mount may carry no more than 3 Saab-Saaker AAMs (3 x 90 kg = 270 kg, but 4 x 90 kg = 360 kg). Internal missile mounts may store as many missiles as there is internal cargo space allocated (3 CF per rocket/missile). Can vehicles or drones with mechanical arms use them to carry and fire weapons? And can they carry vehicle “class” weapons if the arms are strong enough (for example, the various miniguns or rotary autocannons)? Mechanical arms function in the same manner as normal arms (or cyberarms). As such, they are not subject to the rules for hardpoints or firmpoints, but rather follow standard recoil rules. The optional advanced rule for reducing recoil from Strength (p. 103, Cannon Companion) may also be used with mechanical arms. Mechanical arms cannot fire vehicle weapons; these must be mounted on a fixed mount or in a turret. Does Fuel Tank Enlargement (p. 115 R3) require 1 CF per 50 liters or part thereof, or only require 1 CF for every full 50 liters? 1 CF per 50 liters or any portion thereof. As an optional rule, gamemasters may allow fractional increments of 0.1 CF per 5 liters to save on space, but it will still cost the full 2 Design Points. If I wanted to carry a vehicle in an enclosed trailer, how much CF would the vehicle take up? Is there a different equation than the one for calculating drone storage? There isn’t. Use the same drone storage formula on p. 62 of R3 (CF = [Body + 1.5] x Body, rounded down). Of course, since there is wide variation of vehicle shapes and sizes even in the same Body range, you should feel free to modify it on the upwards side, anywhere from a factor of 2x to 10x. Shouldn’t shapeshifters have Enhanced Sense abilities of some sort when in animal form? Shapeshifters have the standard senses as appropriate to the animal form. These senses may be more potent (or weaker) than the standard (meta)human senses, but it is not any more potent than other animals of that type. Do Koborokuru receive the standard thermographic vision of dwarfs? Do Night Ones and Dryads receive the standard low light vision of elves? Does a drake player character have to allocate starting attribute points to two sets of physical attributes, like a shapeshifter does? No. Allocate starting attribute points to just one set of Physical attributes. Determine the Karma cost for improving skills or attributes using the (meta)human Physical attributes. The Physical Attribute modifiers for a character’s drake form are: +4 Body, +4 Strength, +1 Quickness, +1 Reaction, +1 Reach, x4 Running modifier. Does it cost more at character creation to play a drake with dwarf, elf, ork or troll metahuman form? If you are using the Priority System for character creation, the answer is: No, the metahuman form is a freebie. To even the playing field, however, we recommend that you use the Point-Based System. If you are using the Point-Based System, you must pay the cost for the metatype in addition to the 25 points for being a bred drake. Does the bred drake have any Armor while in drake form? Is this Hardened Armor, like dragons have? Yes. The bred drake has 6 points of natural armor (Impact and Ballistic) while in drake form. This armor is not hardened (drake armor is softer than dragon armor). Do drake abilities like Enhanced Senses or Innate Spell (Flamethrower) work in (meta)human form? Do metahuman abilities like troll dermal, troll Reach or dwarf disease resistance apply in drake form? When a drake uses astral perception, does it suffer the +2 TN penalty to non magical actions? No. This is one advantage of being dual natured. Do drakes in drake form do Physical or Stun damage in unarmed combat? Physical. They use their claws and teeth. Can dice from more than one pool be used if both pools are applicable? If a character can use dice from more than one pool at once, is he still limited to a number of total pool dice equal to the appropriate skill? Yes and Yes. Astral Pool can be used along with Astral Combat Pool, for example. You can never use more pool dice (total, from all applicable pools) than the relevant skill dice. What are the rules for the Disguise skill presented on p. 104, SOTA: 2063? If a character is trying to make himself look different from how he normally looks, make an Open Disguise Test. Other characters use Perception to see through the disguise. If the character is trying to look like someone specific, he makes a Success Test with a TN based on how difficult the transformation is (use the standard Difficulty TNs on p. 92, SR3). What do high-frequency and low-frequency hearing actually do for the character who has them? What is the actual use of these abilities? One immediate use for high-frequency (ultrasonic) and low-frequency (infrasonic) hearing would be for clandestine communication. Characters with voice mask modulators and one of these hearing options could communicate at frequencies outside of the range of normal metahuman hearing. Likewise, a character could modify their electronic communication devices so that they emit sound at ultrasonic or infrasonic frequencies, limiting the likelihood that someone would eavesdrop. Ultrasonic communication in this manner also has the advantage of being possible even in otherwise noisy environments. Low-pitched infrasonic communication can travel greater distances than ultrasonic communication. There is also a chance that metahumans might “feel” it even if they can’t “hear” it. Infrasonic communication, however, is slower. Obviously, ultrasonic hearing can detect ultrasonic sounds (normally undetectable by metahumans): ultrasound imaging equipment, ultrasonic motion detectors, industrial-use ultrasonic cleaners and welders, echo location used by bats, dolphins and cetaceans underwater, compressed gas leaks, mechanical and electrical sounds, motor frictional noises, etc. Ultrasonic hearing could also be used for a limited form of echolocation (similar to how ultrasound imaging systems work), assuming there is a source of ultrasonic noise. Likewise, infrasonic hearing can detect infrasonic noise: whale calls, elephants, alligators, thunderstorms, earth tremors, ocean waves, volcano rumblings/eruptions, explosions, vehicles, the trample of approaching feet, and ‘sprites’ (sudden electrical discharges in the upper atmosphere). Infrasounds can be heard over further distances than regular sounds, and they can penetrate solids better. Does the Regeneration power of shapeshifters and other critters work against Stun damage? Do shapeshifters heal more quickly? Why do Deadly wounds evaporate with Regeneration, but near-deadly wounds take long periods to heal? No, Regeneration does not work on Stun damage. Each time a regenerating creature takes damage (Physical or Stun), roll 1D6. On any result other than 1 (or 1 or 2 in the case of damage caused by fire or other massive trauma/tissue damage), that damage will regenerate. Physical damage regenerates at the rate of 1 box per Combat Turn. Stun damage regenerates at the rate of 1 box per minute. Regenerated damage disappears at the end of the Combat Turn. Only one wound can be regenerated at a time, though Physical wounds heal before Stun (so a shapeshifter who takes 3 boxes of Physical and then a box of Stun must wait for the Physical damage to heal before the Stun heals).Damage from Drain cannot be regenerated. Damage that does not regenerate heals at normal speeds. 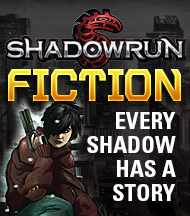 This FAQ is maintained by Rob Boyle, the Shadowrun Line Developer. 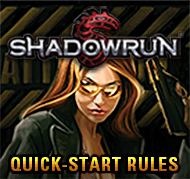 If you have suggested additions or changes, send them to info@shadowrun4.com. Thanks to Elissa Carey, Adam Jury, Steve Kenson, Christian Lonsing, Michelle Lyons, Jon Szeto and Larry White for feedback and assistance.